Leonardo DiCaprio is an American actor and producer who started his career performing as a child on television. He appeared on the shows The New Lassie (1989) and Santa Barbara (1990) and also had long running roles in the comedy-drama Parenthood (1990) and the sitcom Growing Pains (1991). Two years later, he played Tobias Wolff opposite Robert De Niro in This Boy's Life (1993), marking this film as his cinematic debut. He followed this with a supporting role in What's Eating Gilbert Grape (1993), which earned him a nomination for the Academy Award for Best Supporting Actor. In 1995, DiCaprio played the American author Jim Carroll in The Basketball Diaries and the French poet Arthur Rimbaud in Total Eclipse. The following year he played Romeo Montague in the Baz Luhrmann-directed film Romeo + Juliet (1996). DiCaprio starred opposite Kate Winslet in the James Cameron-directed film Titanic (1997). The film became the highest grossing at the worldwide box-office,[a] and made him famous globally. For his performance, he received the MTV Movie Award for Best Male Performance and his first nomination for the Golden Globe Award for Best Actor – Motion Picture Drama. In 2002, DiCaprio played con-artist Frank Abagnale, Jr. opposite Tom Hanks in the Steven Spielberg-directed biographical crime-drama Catch Me If You Can and also starred in the Martin Scorsese-directed historical period drama Gangs of New York. He founded his own production company, Appian Way, in 2004. The next two films he starred in were both directed by Scorsese: the Howard Hughes biopic The Aviator (2004) and the crime drama The Departed (2006). For his portrayal of Hughes in the former, DiCaprio won the Golden Globe Award for Best Actor – Motion Picture Drama and garnered his first nomination for the Academy Award for Best Actor. DiCaprio produced the environmental documentary The 11th Hour and the comedy-drama Gardener of Eden in 2007. The following year, he reunited with Kate Winslet in the Sam Mendes-directed drama Revolutionary Road and appeared in the Ridley Scott-directed action film Body of Lies. DiCaprio reteamed with Scorsese in 2010 in the psychological thriller Shutter Island and also starred in the Christopher Nolan-directed science fiction heist thriller Inception. In 2011, he portrayed J. Edgar Hoover, the first director of the FBI, in the biopic J. Edgar. The following year, he played a supporting role in the Quentin Tarantino-directed western Django Unchained. 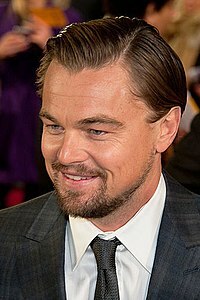 DiCaprio starred in two film adaptations of novels in 2013; he first appeared as Jay Gatsby in the Luhrmann-directed adaptation of F. Scott Fitzgerald's novel The Great Gatsby, and later as Jordan Belfort in The Wolf of Wall Street, an adaptation of Belfort's memoir of the same name. The latter earned him a third Academy Award nomination for Best Actor and a Golden Globe Award for Best Actor – Motion Picture Musical or Comedy. In 2015, DiCaprio played fur trapper Hugh Glass in the survival drama The Revenant, for which he won the Academy Award for Best Actor. 1989 Glen Episode: "New Generation"
^ Titanic has since been surpassed by the Cameron-directed science fiction film Avatar (2009) which holds the record as of 2014. ^ "The 66th Academy Awards (1994) Nominees and Winners". Academy of Motion Picture Arts and Sciences (AMPAS). Archived from the original on April 29, 2011. Retrieved September 29, 2014. ^ "Avatar overtakes Titanic as top-grossing film ever". BBC News. January 27, 2010. Retrieved October 31, 2014. ^ Wight, Douglas (April 2, 2012). Leonardo DiCaprio – The Biography. London: John Blake Publishing Ltd. p. vi. ISBN 9781857826722. ^ "1998 MTV Movie Awards". MTV. Archived from the original on January 26, 2015. Retrieved October 31, 2014. ^ Ventre, Michael (January 7, 2003). "Leonardo DiCaprio". Variety. Penske Media Corporation. Archived from the original on November 16, 2014. Retrieved October 31, 2014. ^ Wight, Douglas (April 2, 2012). Leonardo DiCaprio – The Biography. London: John Blake Publishing Ltd. p. 142. ISBN 9781857826722. ^ "'Aviator' lands Golden Globe glory". CNN. Turner Broadcasting System. January 17, 2005. Archived from the original on October 17, 2014. Retrieved September 29, 2014. ^ "Nominees & Winners for the 77th Academy Awards". Academy of Motion Picture Arts and Sciences (AMPAS). Archived from the original on October 20, 2010. Retrieved September 29, 2014. ^ "DiCaprio on Winslet: 'She will let me strangle her until she passes out". The Guardian. Guardian Media Group. November 17, 2008. Archived from the original on October 21, 2014. Retrieved September 29, 2014. ^ "2014 Oscar Nominees". Academy of Motion Picture Arts and Sciences (AMPAS). January 16, 2014. Archived from the original on October 6, 2014. Retrieved January 16, 2014. ^ "Golden Globe Awards Winners". Variety. Penske Media Corporation. January 12, 2014. Archived from the original on March 20, 2014. Retrieved March 10, 2014. ^ a b c d e f Wight, Douglas (April 2, 2012). Leonardo DiCaprio – The Biography. London: John Blake Publishing Ltd. p. 276. ISBN 9781857826722. ^ Maslin, Janet (December 17, 1993). "Review/Film; Johnny Depp as a Soulful Outsider". The New York Times. Arthur Ochs Sulzberger Jr. Archived from the original on October 6, 2014. Retrieved September 29, 2014. ^ Ebert, Roger (February 10, 1995). "The Quick and the Dead Movie Review (1995)". Roger Ebert. Archived from the original on October 6, 2014. Retrieved September 29, 2014. ^ Maslin, Janet (April 21, 1995). "The Basketball Diaries (1995) Film Review; Looking for Poetry In All the Wrong Places". The New York Times. Arthur Ochs Sulzberger Jr. Archived from the original on October 6, 2014. Retrieved September 29, 2014. ^ Turan, Kenneth (November 3, 1995). "Movie Review : 'Eclipse' a Grim Tale of Licentious Poets". Los Angeles Times. Tribune Publishing. Archived from the original on October 6, 2014. Retrieved September 29, 2014. ^ "Review: 'William Shakespeare's Romeo & Juliet'". Variety. Penske Media Corporation. October 27, 1996. Archived from the original on October 7, 2014. Retrieved September 29, 2014. ^ Levy, Emanuel (December 14, 1996). "Review: 'Marvin's Room'". Variety. Penske Media Corporation. Archived from the original on November 16, 2014. Retrieved September 29, 2014. ^ Ebert, Roger (December 19, 1997). "Titanic Movie Review & Film Summary (1997)". Roger Ebert. Archived from the original on October 6, 2014. Retrieved September 29, 2014. ^ "The Man in the Iron Mask". The New York Times. Arthur Ochs Sulzberger Jr. Archived from the original on October 6, 2014. Retrieved September 29, 2014. ^ Ebert, Roger (November 20, 1998). "Celebrity Movie Review & Film Summary". Roger Ebert. Archived from the original on October 6, 2014. Retrieved September 29, 2014. ^ "The Beach (2000)". The New York Times. Arthur Ochs Sulzberger Jr. Archived from the original on October 6, 2014. Retrieved September 29, 2014. ^ "Holiday Movies / Sit back and enjoy his flight / DiCaprio tries to stay one step ahead of the law in Spielberg's lighthearted 'Catch Me If You Can'". San Francisco Chronicle. Hearst Corporation. December 25, 2002. Archived from the original on October 6, 2014. Retrieved September 29, 2014. ^ Ebert, Roger (December 20, 2002). "Gangs of New York Movie Review (2002)". Roger Ebert. Archived from the original on October 6, 2014. Retrieved September 29, 2014. ^ "The Aviator (2004) – Acting Credits". The New York Times. Arthur Ochs Sulzberger Jr. Archived from the original on October 6, 2014. Retrieved September 29, 2014. ^ Dargis, Manohla (October 6, 2006). "Scorsese's Hall of Mirrors, Littered With Bloody Deceit". The New York Times. Arthur Ochs Sulzberger Jr. Archived from the original on December 4, 2014. Retrieved September 29, 2014. ^ Roeper, Richard. "Blood Diamond Review". Richard Roeper. Archived from the original on October 6, 2014. Retrieved September 29, 2014. ^ Dargis, Manohla (August 17, 2007). "The 11th Hour (2007)". The New York Times. Arthur Ochs Sulzberger Jr. Archived from the original on October 3, 2014. Retrieved September 29, 2014. ^ "Film review: Body of Lies". The Guardian. Guardian Media Group. November 21, 2008. Archived from the original on October 9, 2014. Retrieved September 27, 2014. ^ Ebert, Roger (December 30, 2008). "Revolutionary Road Movie Review (2008)". Roger Ebert. Archived from the original on October 6, 2014. Retrieved September 29, 2014. ^ Ebert, Roger (February 17, 2010). "Shutter Island Movie Review & Film Summary (2010)". Roger Ebert. Archived from the original on October 6, 2014. Retrieved September 29, 2014. ^ "Review: 'Hubble 3D'". Variety. Penske Media Corporation. March 14, 2010. Archived from the original on November 17, 2014. Retrieved September 29, 2014. ^ French, Philip (July 18, 2010). "Inception: Film Review". The Guardian. Guardian Media Group. Archived from the original on May 19, 2014. Retrieved September 29, 2014. ^ Schutte, Lauren (November 8, 2011). "Leonardo DiCaprio As J. Edgar Hoover: What The Critics Think". The Hollywood Reporter. Prometheus Global Media. Archived from the original on October 12, 2014. Retrieved September 29, 2014. ^ "'Django Unchained' a brazen, bloody spectacle, critics say". Los Angeles Times. Tribune Publishing. December 26, 2012. Archived from the original on October 6, 2014. Retrieved September 28, 2014. ^ Foundas, Scott (May 5, 2013). "Film Review: 'The Great Gatsby'". Variety. Penske Media Corporation. Archived from the original on February 24, 2015. Retrieved September 29, 2014. ^ "The Wolf of Wall Street (2013)". The New York Times. Arthur Ochs Sulzberger Jr. Archived from the original on October 6, 2014. Retrieved September 29, 2014. ^ Miller, Julie (October 27, 2015). "Why Leonardo DiCaprio, Robert De Niro, and Martin Scorsese Convened in a Macau Casino". Vanity Fair. Archived from the original on February 29, 2016. Retrieved February 29, 2016. ^ Masters, Kim (July 22, 2015). "How Leonardo DiCaprio's 'The Revenant' Shoot Became "A Living Hell"". The Hollywood Reporter. Prometheus Global Media. Archived from the original on August 13, 2015. Retrieved August 12, 2015. ^ Thorp, Charles. "'Before the Flood': Leonardo DiCaprio's Toughest Role Yet". Men's Journal. Archived from the original on November 4, 2016. Retrieved November 3, 2016. ^ Kit, Borys (February 28, 2018). "Brad Pitt, Leonardo DiCaprio to Star in Quentin Tarantino's Sharon Tate Drama". The Hollywood Reporter. Retrieved July 29, 2018. ^ Vivarelli, Nick (July 14, 2017). "Leonardo DiCaprio, Martin Scorsese Teaming Up for New Movie". Variety. Retrieved July 14, 2017. ^ "The Aviator (2004) – Acting Credits". The New York Times. Arthur Ochs Sulzberger Jr. Retrieved September 29, 2014. ^ "The Aviator (2004) – Production Credits". The New York Times. Arthur Ochs Sulzberger Jr. Retrieved September 29, 2014. ^ "The Assassination of Richard Nixon". The New York Times. Arthur Ochs Sulzberger Jr. Archived from the original on October 6, 2014. Retrieved September 29, 2014. ^ Dargis, Manohla (August 17, 2007). "The 11th Hour (2007)". The New York Times. Arthur Ochs Sulzberger Jr. Retrieved September 29, 2014. ^ Buchanan, Jason. "Gardener of Eden (2007)". The New York Times. Arthur Ochs Sulzberger Jr. Archived from the original on October 6, 2014. Retrieved September 29, 2014. ^ "Orphan (2009)". The New York Times. Arthur Ochs Sulzberger Jr. Archived from the original on October 6, 2014. Retrieved September 29, 2014. ^ Dargis, Manohla (March 10, 2011). "The Girl Who Sighed Wolf". The New York Times. Arthur Ochs Sulzberger Jr. Archived from the original on October 6, 2014. Retrieved September 29, 2014. ^ "The Ides of March (2011) – Production Credits". The New York Times. Arthur Ochs Sulzberger Jr. Archived from the original on October 6, 2014. Retrieved September 29, 2014. ^ McCarthy, Todd (September 25, 2013). "Runner Runner: Film Review". The Hollywood Reporter. Prometheus Global Media. Archived from the original on October 12, 2014. Retrieved September 29, 2014. ^ Dargis, Manohla (December 3, 2013). "Fraternal Ties, of Gut and Sinew". The New York Times. Arthur Ochs Sulzberger Jr. Archived from the original on April 7, 2014. Retrieved September 29, 2014. ^ "The Wolf of Wall Street (2013)". The New York Times. Arthur Ochs Sulzberger Jr. Retrieved September 29, 2014. ^ Hooton, Christopher (November 11, 2014). "Virunga on Netflix: Leonardo DiCaprio hopes to save 'one of the last pristine places on Earth' with moving gorilla documentary". The Independent. Independent Print Limited. Archived from the original on January 22, 2015. Retrieved January 21, 2015. ^ "Catching the Sun". Netflix. Retrieved September 19, 2018. ^ Armstrong, Olivia (August 27, 2015). "Exclusive: Interview With Directors Of 'Cowspiracy: The Sustainability Secret' On Netflix, A Controversial New Documentary". Decider. Archived from the original on August 28, 2015. Retrieved August 28, 2015. ^ Abele, Robert (September 2, 2016). "'The Ivory Game' Telluride Review: Urgent Documentary About Elephant Killing Is a Roar for Action". TheWrap. Archived from the original on October 8, 2016. Retrieved October 2, 2016. ^ McGovern, Joe (September 8, 2016). "Before the Flood: Watch an exclusive clip from Leonardo DiCaprio's climate change documentary". Entertainment Weekly. Archived from the original on September 9, 2016. Retrieved September 10, 2016. ^ "Ben Affleck And Warner Bros Set Next Film: Dennis Lehane Crime Novel 'Live By Night'". Deadline Hollywood. May 7, 2013. Archived from the original on August 19, 2014. Retrieved May 7, 2013. ^ Fleming Jr, Mike (February 26, 2015). "A Third Robin Hood Script Enters The Fray; This By King Arthur Scribe Joby Harold". Deadline Hollywood. Archived from the original on June 29, 2015. Retrieved June 7, 2015. ^ Kroll, Justin (January 29, 2014). "DiCaprio, Blum, King Team for Haunted House Pic". Variety. Retrieved May 26, 2018. ^ "The New Lassie Episode Guide 0001 – New Generation". TV Guide. CBS Interactive. Archived from the original on October 6, 2014. Retrieved September 29, 2014. ^ "The New Lassie Episode Guide 0001 – Snake Pit". TV Guide. CBS Interactive. Archived from the original on October 6, 2014. Retrieved September 29, 2014. ^ "Leonardo DiCaprio Credits". TV Guide. CBS Interactive. Archived from the original on October 6, 2014. Retrieved September 29, 2014. ^ "Greensburg Season 3". Discovery Channel. Archived from the original on October 6, 2014. Retrieved September 29, 2014. ^ Coleman, Miriam (January 26, 2014). "Leonardo DiCaprio and Jonah Hill Reenact 'Titanic' on 'SNL'". Rolling Stone. Wenner Media LLC. Archived from the original on October 10, 2014. Retrieved September 29, 2014.